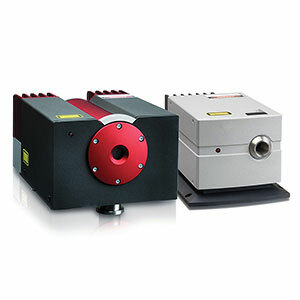 Family of ultra-narrow linewidth (~1 kHz) frequency-tunable CW lasers at 1064 nm and 1319 nm with output power up to 2 W.
Mephisto lasers are available at 1064 nm and 1319 nm with output power up to 2 W. Mephisto S is a cost-effective version available only at 1064 nm with output power up to 0.5 W. Fiber coupling is available as an option for all variants. All Mephisto family products utilize a Non-Planar Ring Oscillator (NPRO). This is a miniature monolithic laser cavity with the intracavity path completely inside the Nd:YAG crystal. The combination of this non-planar structure, an externally applied magnetic field, the total internal reflections (TIR) and polarization-sensitive output coupling enable unidirectional lasing that is the foundation for a single frequency operation. The small size of the resonator enables a wide separation of the longitudinal modes and simple thermal frequency tuning (over 30 GHz). The application of mechanical force via an integrated PZT allows fast frequency tuning at 100 kHz bandwidth over a 130 MHz frequency range. Mephisto laser head is cooled by convection in air ensuring the lowest possible noise on the optical table. All Mephisto controller units use fully analog electronics design resulting in the lowest possible electrical noise which translates into an extremely low optical noise in the pump diodes and all the control electronics. Our Noise Eater circuitry located in the laser head minimizes the residual pump diode and relaxation oscillation noise at frequencies below 1 MHz.